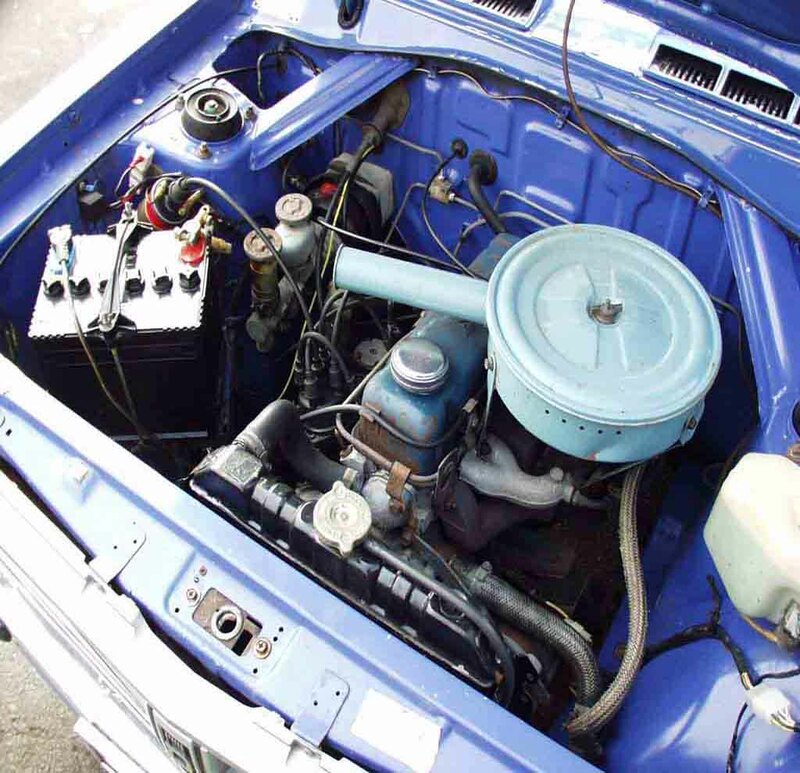 Datsun 1200 uses a small radiator, perfectly adequate for 69HP when in good condition. Using a small radiator is good for light weight and efficiency. B110 radiator has 20% more cooling capacity than B10 unit, yet and same weight. 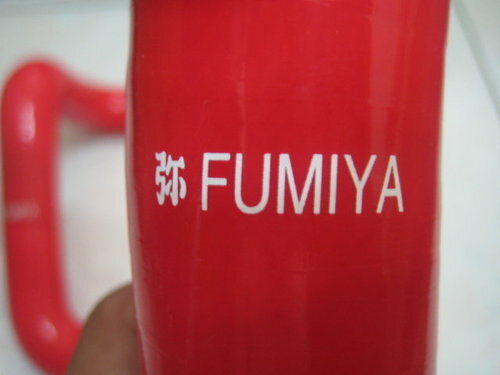 The capacity increase was intended for high speed running. It is not unusual with any 10-year old stock radiator for the temperature to rise during summer. If this occurs with your Datsun, don't panic. The engine can run all day close to the "H" mark. DO NOT let it go onto the H mark. Pull over immediately if it goes past the H mark. Don't wait 30 seconds, it could be too late. 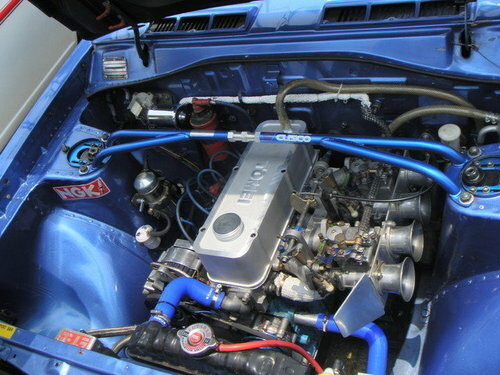 If this worries you, fit a slightly larger radiator to provide more cooling than Datsun provided with the 1200s. For most types of driving, the pointer will hover about halfway. 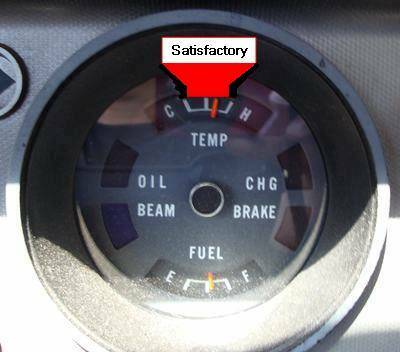 However, the engine will run satisfactorily when the pointer is at any position in the middle range. TIP: Use the stock engine-drive fan. Electric fans are notorious for failing to cool the radiator in stop/go traffic. Of course an electric fan can work well, but many don't. 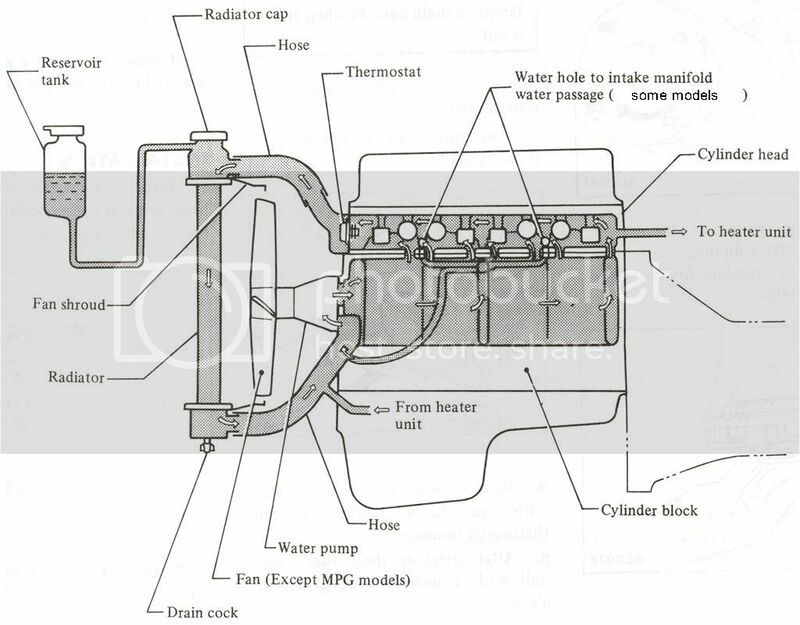 What is the correct temperature the engine should run at? Primarily, this depends on the thermostat. 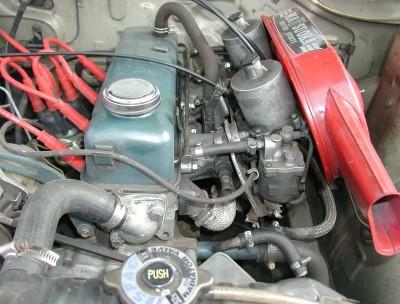 The engine can run fine at a variety of temperatures. 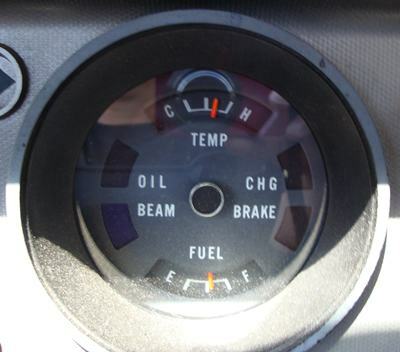 You can get different temp thermostats, and the coolant should stay steady at that temperature. These three thermostats were mainly because of the heater. 170 for hot climes so the room heater won't put out much heat, 190 for cold climes so the heater puts out more heat. 180 is recommended for all street cars, it will keep the oil at optimum temperature (oil runs about 20 degrees hotter than the coolant). A guy at the oil company told me 180 is ideal for the oil working the best. He went through training for Mobile I think it was and they were formulating oil for 200 degrees, which works out to be 20 degrees warmer than the coolant for most engines. Maybe it's changed now but it won't be colder as engines now run hotter than ever. If anyone has documentation for this please add it here. 160-degree is favored by some for drag racing as they tune the carbs for cold dense air, or for use with low octane fuel. But EFI computers don't run well at cold temps nor does the oil, and cold temps mean more engine wear. Cold temps are not recommended. But won't I make more HP with a colder thermostat? Not if your carburetor jetting is stock -- it expects warmer less dense air. And when you floor the accelerator pedal, the air cleaner hot air duct opens up letting only cooler air in, and the stock Hitachi compensates via the power valve. 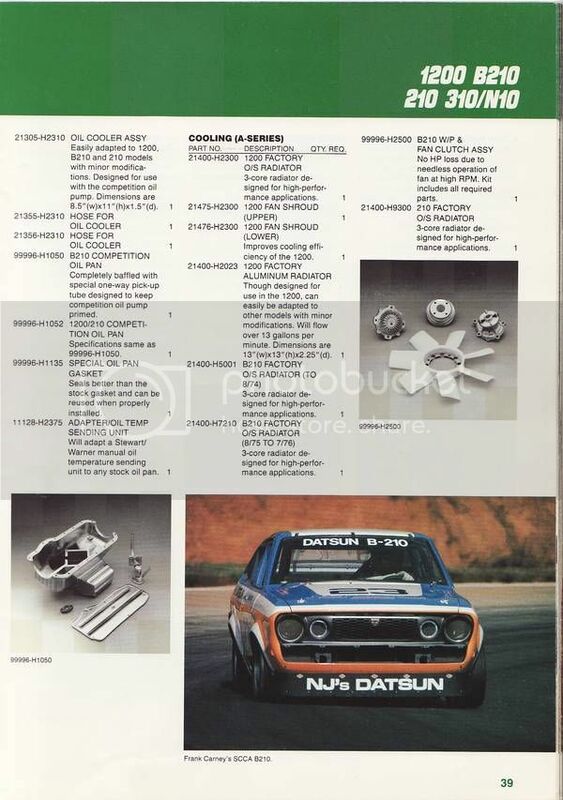 Those clever Datsun engineers had it covered. 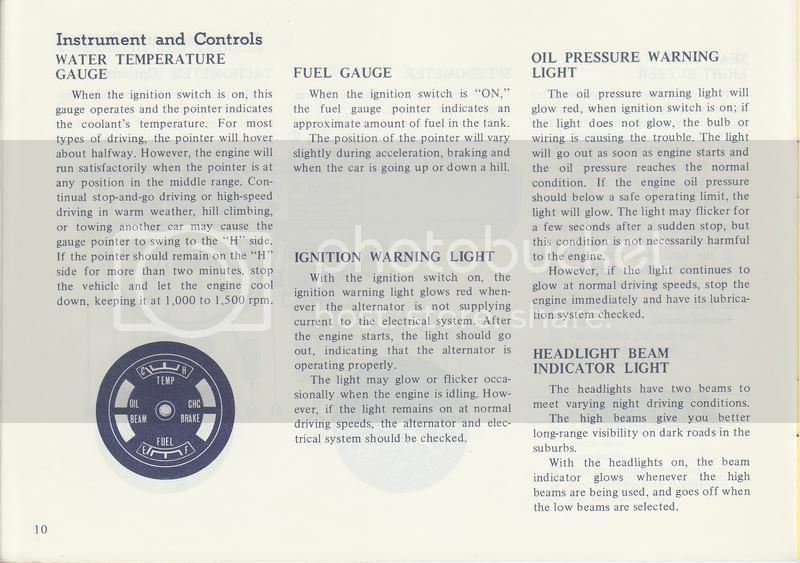 Many cars use a 195 F degree thermostat along with a 14 lb. radiator cap to raise the boiling point. A radiator is more efficient at higher temperatures, because the temperature differential to the air will be greater, thus shedding heat faster. In turn airflow can be reduced which increases aerodynamics. After the thermostat, the radiator is the next factor. If your temp. stays steady except on hot summer days (which is normal), you can use a bit larger replacement radiator and it will stay steady even during temperature peaks. 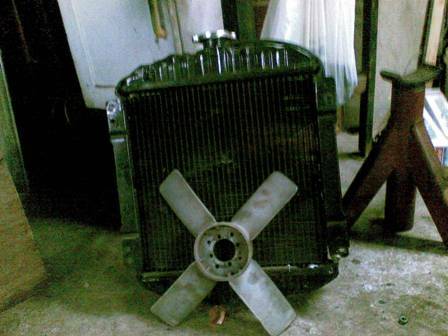 Use either a new unit, rebuilt unit, or a good used unit from a B210 or B310, which are larger than the 1200 radiator. 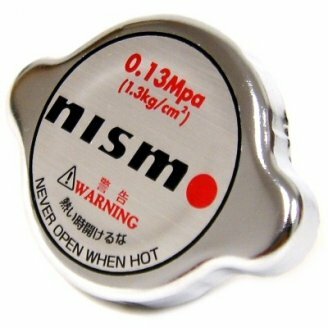 Use a 13 lb cap as per original specification. 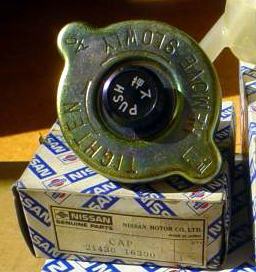 The Nismo high-pressure 18.2 lb (1.3 bar) caps are solely for 100C-degree (212F) thermostats. 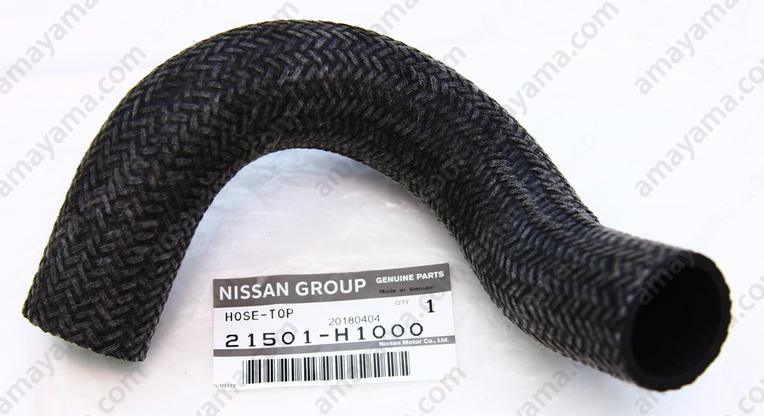 A lower pressure will help prevent leaks in the radiator, heater core and hose connections. Extra high-pressure caps allows you to run a higher temperature thermostart where the engine to runs above normal boiling point of the coolant. The extra high temperature means the radiator sheds head faster (larger temp differential to the air). This means a smaller radiator will be adequate. 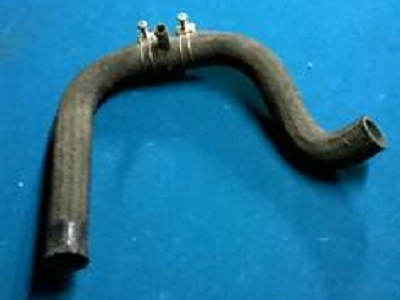 The downside is that old radiators, heater cores and hoses may not be able to handle the pressure and may start leaking. Don't bother to replace the radiator before you test it! Make sure it's bad first. Radiator blocked. Test the flow. Electric Fan not working correctly. Check for proper rotation, if it's backwards overheating will occur. Check to see if the fan is running. 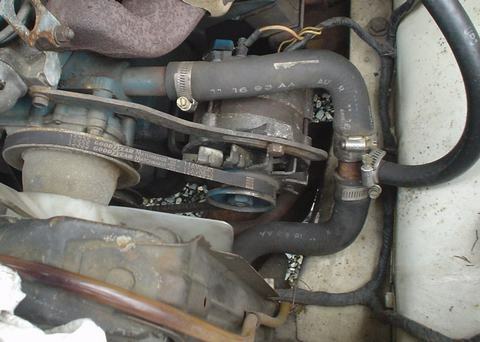 With engine cold, take off the lower hose of the radiator. Block it with your hand, and fill the radiator with plain water. Take your hand off and the water should gush out -- in a big stream as large as the lower opening. If it runs out in a smaller stream, the radiator has partial blockage inside and should be replaced or repaired. 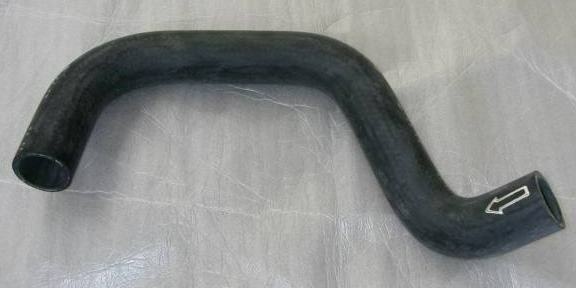 With engine cold, remove the bottom radiator hose (the water will drain out). Leave the hose disconnected. Stick a garden hose into the top of the radiator and turn it on. If the water does not flow into the radiator quickly i.e. if it overflows at all then the core is possibly blocked. 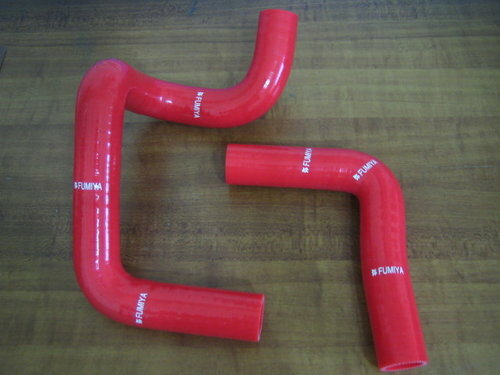 A radiator should flow easily and quickly, there should be little resistance to flow. 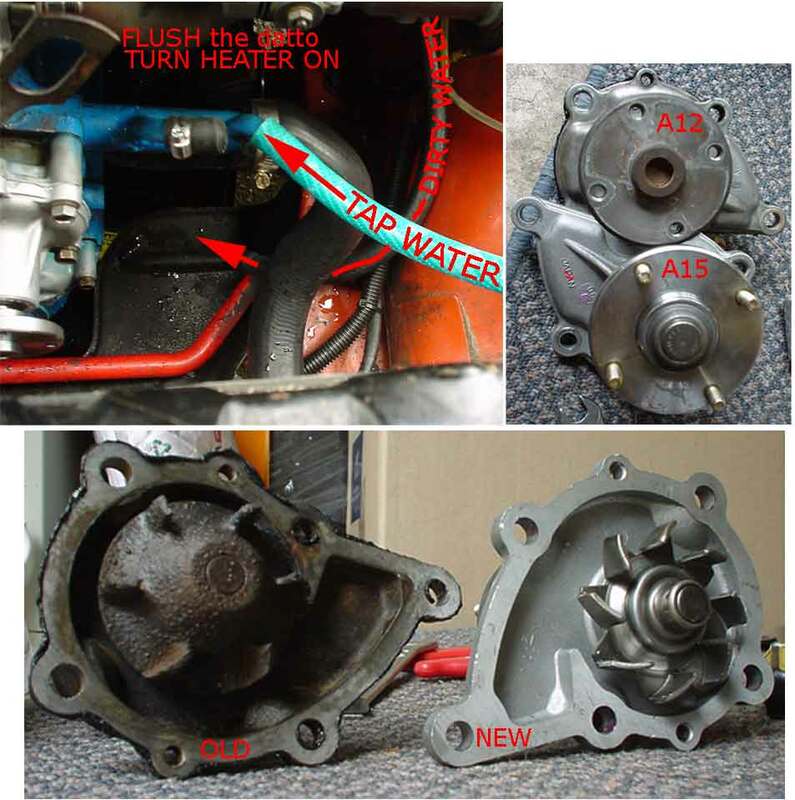 A simple test for overheating is to remove the thermostat. If then it keeps cool you know that's the problem and should replace thermostat. For more advanced testing see Thermostat#Thermostat_Testing. Heating up at idle is usually caused by the fan, especially electric fans. This is usually caused by airflow problems, especially with electric fans. The engine produces more heat at speed than at idle, so the radiator is fine if it keeps cool at speed. But the airflow varies -- at speed it doesn't need a fan, but with the car stopped, only the fan keeps air blowing through the radiator fins. 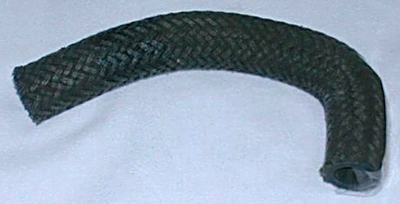 Causes may be blocked fins or damaged fins that the lesser airflow aggravates. The easiest check is for low coolant level. 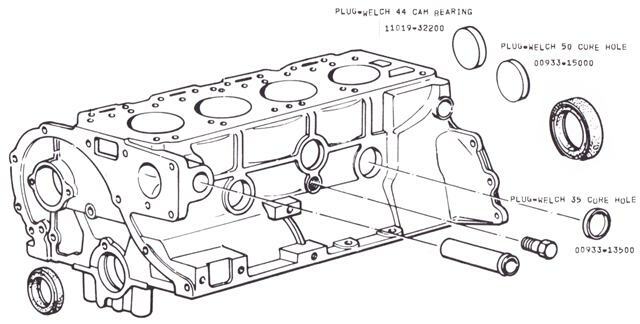 When the engine has cooled, remove the radiator cap and ensure coolant is covering the tubes (the level should be about 1" below the bottom of the cap fitting). If the engine cools fine at speed, the radiator itself is fine. 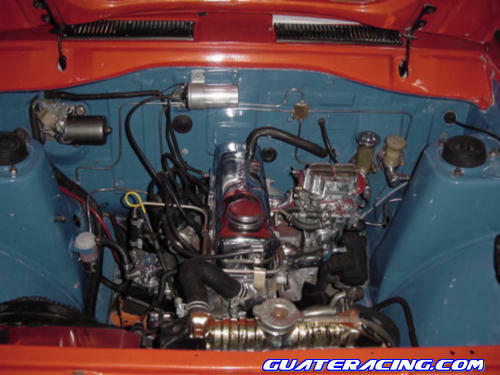 The engine produces more heat at speed than at idle, and if the radiator can handle that you have a good radiator. Overheating at idle is an airflow problem. Less likely is a blown head gasket. A blown head gasket can cause a low coolant level, which you can easily check (when cooled off, open the radiator cap and look). Air in the cooling system can cause overheating, but once cooled down you will see the coolant level is too low. You can try a radiator flushing additive but I'm not sure on their effectiveness. Use a garden hose and flush water through the cooling system (from both top and bottom hoses) until it runs clear, then refill with proper coolant. Don't forget to turn the heater to hot so it gets flushed as well. IMPORTANT: Don't forget to bleed the cooling system. 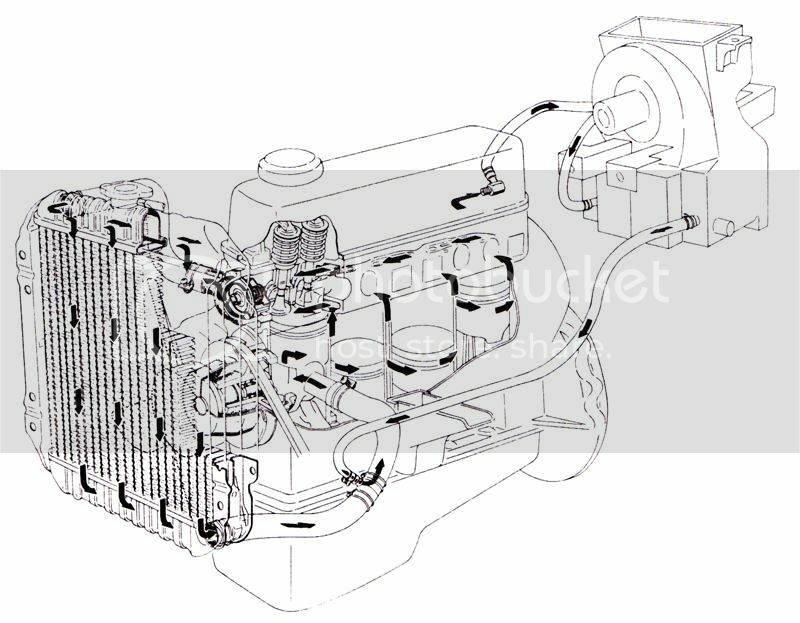 Fill it with coolant and run the engine (with no radiator cap and heater on hot) until the thermostat opens (you will see (hot)coolant flowing rapidly across the top of the radiator), then top it up and shut the engine off, leaving it to cool comepletely. 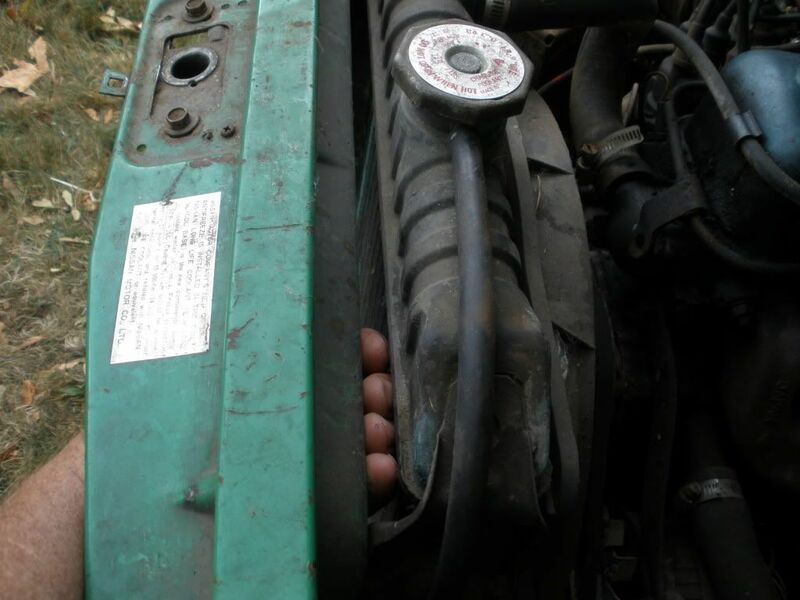 Once cold, top up the coolant and put the radiator cap on. 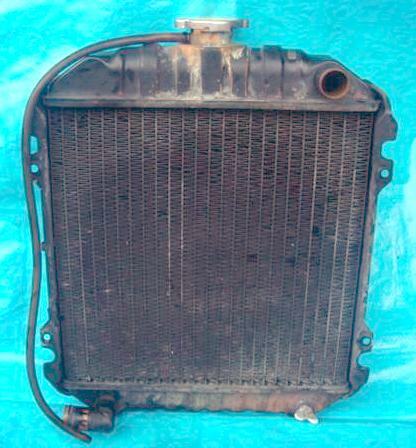 The stock Datsun 1200 radiator has a core of 13.0 x 13.5 inches. GX comes with three-core of same dimensions. including brackets. Tall dimension is to top of radiator cap. 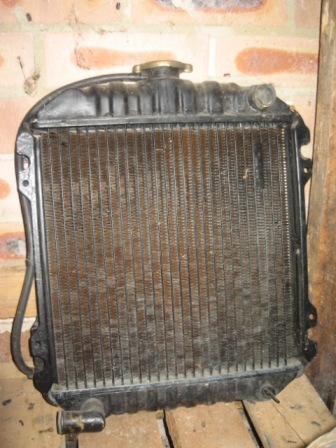 1980-1994 radiator are like early ones, but the bottom fitting exits to the left instead of straight out as in the original. 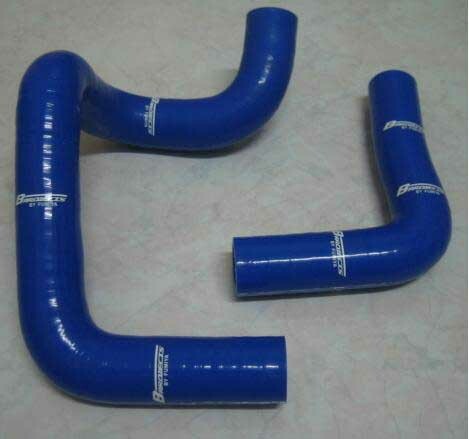 The Datsun 1200 radiator hoses are 1" inside diameter. Lower with heater (Rad. 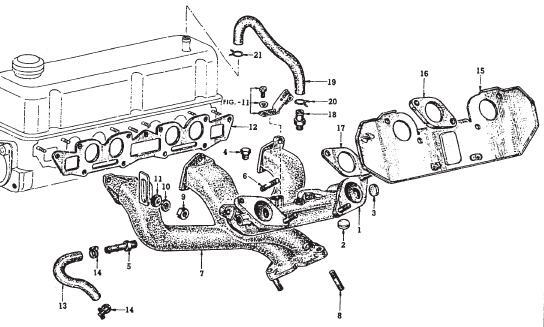 to Pipe): 9.5 to 10"
Lower with heater (Pipe to Eng): 9.0 to 9-13/16"
A12GX Engine uses a water-heated inlet manifold. Switch for Temperature Gauge (thermal transmitter). 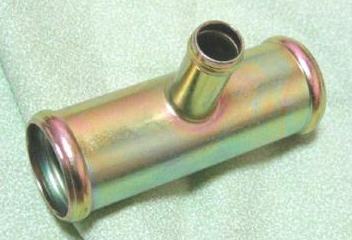 The stock 1200 radiator is not made of cheap aluminum, but of the more expensive metals: Brass tanks and Copper fins. The brass is easily polished with a scouring pad, although it does take a bit of time. This page has been accessed 79,320 times. This page was last modified 12:45, 9 February 2019. Content is available under Datsun 1200 Club.